Learn the Revision Total Hip replacement: Direct exchange Link MP revision stem for periprosthetic fracture surgical technique with step by step instructions on OrthOracle. Our e-learning platform contains high resolution images and a certified CME of the Revision Total Hip replacement: Direct exchange Link MP revision stem for periprosthetic fracture surgical procedure. Intra-operative fracture rates during total hip replacement have been reported as high as 7% which is a disappointing figure but simply reflects the strength of implants and instrumentation compared to the relative weakness of adult bone. 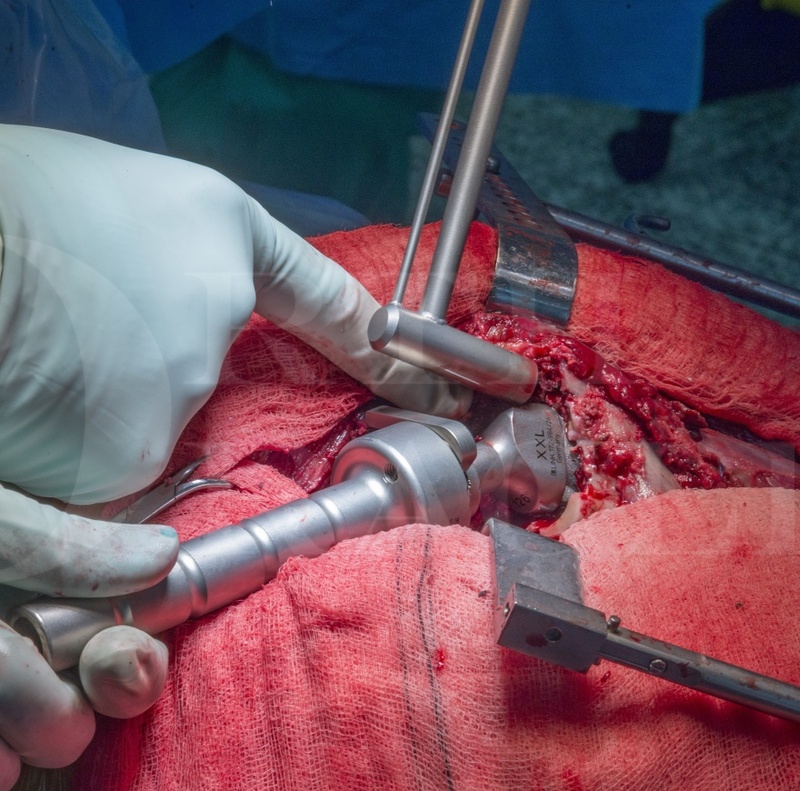 Some cases are potentially avoidable but even an experienced surgeon following best practices and excercising all his skill will inevitably encounter such events and should be in a position to manage them. To avoid iatrogenic peri-prosthetic fractures fractures I would strongly suggest always carefully templating pre-surgery as well as being entirely familiar with the implant. If intra-operatively trial sizes are going significantly above those that have been templated or following some resistance to rasping there is a suddenly easy passage of the rasp it is beholdent upon the surgeon to consider the possibility of an iatrogenic fracture and proceed appropriately. I would recommend exploring the femur (as detailed in this technique) following the use of intraoperative radiographs if a femoral fracture is confirmed. The Vancouver classification for intra-operative fractures is a logical descriptor which reliably guides the management of these complex and technically challenging injuries, though its preferable not to need to refer to it too often during a primary joint replacements. The Vancouver Classification for Intraoperative fractures is, like its postoperative counterpart, logical. It classifies the area of fracture as being either proximal metaphysis (A), proximal diaphysis (B) or as being distal to the implant (C). Each of these areas is also subdivided into 1, 2 and 3 representing a cortical perforation, an undisplaced crack or a displaced fracture respectively. This technique demonstrates the use of the MP stem (Link) for an acute peri-prosthetic femoral fracture of a total hip replacement. The MP stem is a modular, cementless stem with a porous finish allowing bony on-growth. Leg length, offset and version adjustments are all possible with this versatile system. Within this presentation the Vancouver intraoperative periprosthetic fracture classification is discussed in detail along with principles of peri-prosthetic fracture exposure, implant removal, fracture reduction and maintenance of the femoral fracture. I also discuss methods of achieving leg length and stability after direct exchange.